Actor Kevin Spacey has appeared in court to face a charge of indecent assault and battery stemming from an allegation of groping in 2016. A not-guilty plea was entered on the two-time Oscar winner’s behalf by his lawyers during the hearing in the US state of Massachusetts. He is accused of sexually assaulting an 18-year-old male after plying him with alcohol at a bar in Nantucket in 2016. Assault claims against him have also surfaced in London and Los Angeles. 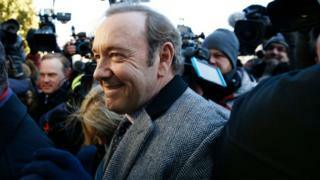 Mr Spacey, 59, was mobbed by media as he arrived at the packed courtroom on the normally sleepy resort island community of Nantucket on Monday after arriving by private jet. Wearing a grey suit with polka-dot tie and floral shirt, the actor looked composed and nodded when Judge Thomas Barrett told him he was not allowed to contact the alleged victim. A lawyer for Spacey – whose legal name is Kevin S Fowler – had earlier asked the judge to allow the hearing to happen without the defendant present, but that request was refused. He was released without having to pay bail by the judge after a 10-minute hearing. The alleged incident occurred at The Club Car restaurant in Nantucket. Prosecutors announced on 24 December that Mr Spacey would be charged with indecent assault and battery stemming from the incident at the Club Car restaurant in Nantucket. The alleged victim is the son of former television news presenter Heather Unruh, who spoke publicly about the incident last year. She accused Mr Spacey of buying her then 18-year-old son alcohol – the drinking age in Massachusetts is 21 – and then groping him. The victim, who is also suing Mr Spacey in civil court, will not be present during the criminal trial. According to prosecutors the teenager told police that the actor had groped him as they stood together at a piano. He told police that he had video of the incident, and had sent a Snapchat of it to his girlfriend. Mr Spacey’s lawyers say the video does not prove his guilt, and during the brief hearing on Monday his lawyer Alan Jackson successfully argued that the alleged victim must not delete the footage for at least six months. After a court hearing that lasted only 10 minutes, Judge Thomas Barrett scheduled the next court date for 4 March. Mr Spacey will not be required to appear at that pre-trial hearing, as long as he is available by phone, the judge ruled. If found guilty, he could face up to five years in prison. What were the other allegations? The BBC’s Nada Tawfik said from the Nantucket courthouse that the Spacey charges mark one of the most stunning downfalls of the #MeToo movement. The actor’s career offers dried up after he was accused by actor Anthony Rapp in 2017 of making a sexual advance on him in 1986 when Mr Rapp was 14 years old. Mr Spacey said he had no memory of the event, but publicly apologised before issuing an “absolute” denial of all other allegations. Separately, in September, the Los Angeles County District Attorney’s office said Mr Spacey would not be prosecuted over an accusation of sexual assault that allegedly took place in 1992. It said it fell outside of California’s statute of limitations. UK police are also investigating several allegations that centre around Mr Spacey’s time serving as artistic director at London’s Old Vic theatre. The controversy has led to the actor being axed from a number of roles, including from House of Cards and the 2017 film All the Money in the World, which was re-shot without him. On Christmas Eve, Mr Spacey posted a video contesting allegations against him.